It takes just a few dollars and a few days for you to start enjoying fresh, healthy produce grown indoors in your own home. Imagine serving a home-cooked meal highlighted with beet, arugula, and broccoli microgreens grown right in your kitchen, accompanied by sautéed winecap mushrooms grown in a box of sawdust in your basement. And if you have never tasted microgreens, all you really need to do is envision all the flavor of an entire vegetable plant concentrated into a single tantalizing seedling. If you respond to the notion of nourishing your guests with amazing, fresh, organic produce that you've grown in your own house, condo, apartment, basement, or sunny downtown office, then you'll love exploring the expansive new world of growing and eating that can be discovered with the help of Indoor Kitchen Gardening. 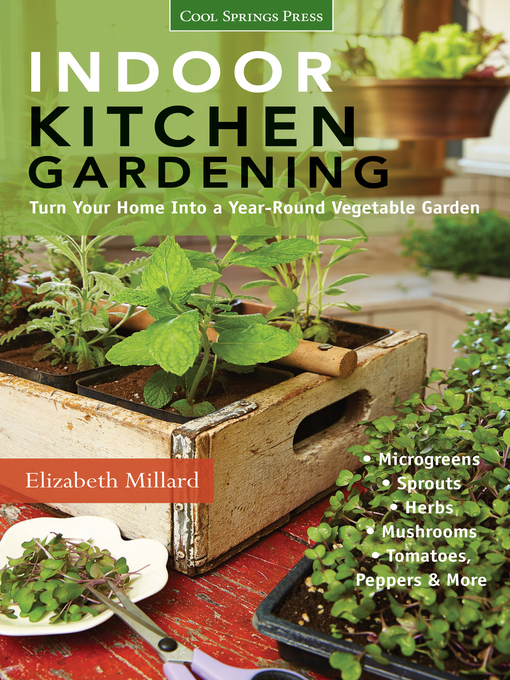 Inside, author and Bossy Acres CSA co-owner Elizabeth Millard teaches you how to grow microgreens, sprouts, herbs, mushrooms, tomatoes, peppers, and more—all inside your own home, where you won't have to worry about seasonal changes or weather conditions. Filled with mouthwatering photography and more than 200 pages of DIY in-home gardening information and projects, Indoor Kitchen Gardening is your gateway to this exciting new growing method—not just for garnishes or relishes, but wholesome, nutritious, organic edibles that will satisfy your appetite as much as your palate.